"Yet, O thou beautiful rose! without the clay at thy feet?" I've always wondered at the association between tea and roses. In my mind it's an English association, accompanied by images of beautiful English gardens, filled with lavender and fountains and winding walks and well-tended roses. 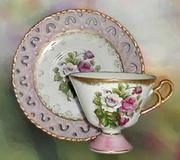 At the far end of the garden sits a small white gazebo shading a small table, laid with silver and china set for tea. The pattern on the china - roses of course. And in the center of the table sits a small vase, filled to overflowing with ... roses! Lovely imagery. When I need a peaceful place inside, that's where I go. I can't quite recreate that here in my desert abode. But for today at least, I am surrounded by roses. Four of my five rose bushes are joyously blooming. This sweet baby at the left is one of my favorites, and the scent she produces is heavenly. To complete the rose-scensual experience, I'm sipping a delicious tea from Portsmouth Tea Company called Rose Congo. It's actually a black tea, scented/flavored with roses, and there are little bits of rose petals mixed into the tea leaves. It's delicious, both in smell and taste. Very delicate. I feel ... wrapped up in roses. Most "rose tea" is a black tea flavored or scented with rose petals. There is actually no such thing as rose tea, not if you're going to be precise, but you can make your own adding dried rose petals to any tea of your choice. You can also make a tasty (and healthy) tisane out of rose hips. The best kind of rose for this purpose, according to GardenGuides' Growing and Harvesting Rose Hips is called Rugosa. It's blooms aren't quite as full as some roses, but it produces a nice big fat fruit when it's done blooming that is higher in vitamin C than an orange, and also high in antioxidants! Check the article for tips on growing, harvesting, and preparing the "hips", plus a recipe for Rose Hip Marmalade. If you can't grow your own, here is one source for buying rose hips online. 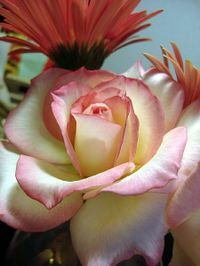 "Tea Rose" was originally the name for a rose that smelled like tea, first introduced to the world in 1867. According to the Old Garden Rose Primer: Tea roses are small to medium-sized plants to 4 feet tall. Some have good "hybrid tea" form, like Catherine Mermet (1869), but most open flat and full like Sombreuil (1850), one of the great exhibition OGR's. Teas are generally known for their large blooms on weak stems which cause the bloom to "droop." These roses are believed to be a cross between Rosa chinensis and Rosa gigantea, where the alleged "tea" scent came from. Crystallized Roses - I'm not sure if this recipe from botanical.com is to be eaten, or just used to decorate other things. Rose Macaroons and Rose Petal Iced Tea in today's Kitchen Crafts Newsletter - how serendipitous is that? Rose Petal Recipes - an amazing collection of rose petal menus and recipes from The Joy of Soup to help you plan your very special brunch, tea, or dinner for Mother's Day. All made with rose petals. Go see. Now. Tea & Roses Newsletter: a full-color quarterly newsletter featuring articles about tea rooms, tea parties, tea tasting, the history, health, and science of tea, and many more tea-related topics, plus a Rose of the Month. So says their website. But you gotta pay. Bummer. Make your own rose water! 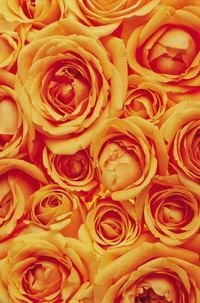 Be sure to use rose petals from flowers that you have not been treated with pesticides. Gather the petals from three or four roses and place them in a saucepan with a pint of water. Heat gently until the roses become transparent, but do not allow them to boil. Let the mixture cool, then strain through a sieve into a jug, pushing the petals with your fingers to extract all of the liquid. Place rose water in a spray bottle and refrigerate. Use as a cooling spray on face or neck or in recipes. Will keep for a week or more in the refrigerator. from Old Fashioned Living. A Red Red Rose... In Ancient Greece and Rome it was believed that roses were all originally white until Venus, the goddess of love, pricked her foot on a rose thorn as she hurried to save her imperiled lover. A drop of her sacred blood fell on the rose petals and dyed it forever red. Rewriting History... The 15th Century conflict between the English royal houses of York and Lancaster is known as the War of the Roses because the men of York supposedly wore a white rose as their badge while those of Lancaster wore a red rose. In fact, Lancaster didn't adopt the red rose as its badge until the wars were over. National Floral Emblem In 1986 Congress adopted the rose as the official flower of the United States, despite Senator E. Dirkson's long campaign for the marigold. Now quit sitting at your computer and go out and smell the roses!! Wow. As someone else who is a fanatic about tea, I love your blog lol. I am going to link to you on my site. Keep up the good work! Hey I just stumbled across your blog and I love it! I was wondering if it's ok with you to put a link to your blog on mine?